Want to get a promotion or make new friends? Then you MUST make this recipe using two new things I’ve discovered at my weekly Trader Joe’s shopping visit. 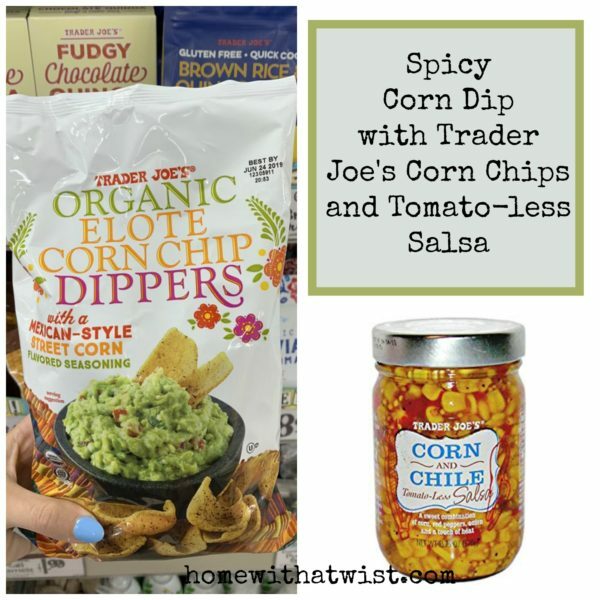 Two must have snacks — Organic Elote Corn Chip Dippers with a mexican-style street corn seasoning and its side-kick Corn and Chile Tomato-Less Salsa. OMG. Go and get a bag or 12 to complete your life or summer entertaining. Here’s how I plan to use them. First, you can pretty much gorge on the corn chips sans anything. They are addictive. But, the salsa lends a nice touch. Not too spicy, but a little kick. Second, I can easily see this salsa poured over a bar of cream cheese and served with either these corn chips or pita chips. But, this is my plan…Spicy Corn Dip. I’ve had this recipe for several years and it’s a winner. I plan to substitute the canned corn for the salsa. 1 cup of grated sharp cheddar cheese (no bagged stuff, it won’t melt properly. ALWAYS shred your own cheese). 3-4 jalapeno peppers, seeded and minced. (you can use as many jalapenos as your preference allows). Mix all the ingredients together and bake in a shallow dish for 20 minutes at 350. Serve with the Trader Joe’s Corn Dips. Check out my YouTube Channel Home with a Twist to watch my latest video here where I talk about this dip and other fun stuff.